LG, Sony, and Panasonic may all be returning to the good old days of flat TVs with their 2016 product families, but Samsung is keeping it wavy with its new range: almost every single one of the manufacturer's 2016 SUHD TVs will be available in a choice of flat or curved. "We sold more curved TVs in 2015 than we did in 2014," Samsung National Sales and Marketing Manager for AV J.P. de Jong told CyberShack. "If you look in our SUHD space, more than half of the screens we sell are curved." Group Product Manager for AV Simon Howe added that the company is seeing more Australians accept and embrace curved design. "When we move to the premium end, we definitely get a wide acceptance of curves," said Howe. "I think that's partly down to design, but the immersive experience helps as well." Of course, curves are just part of what Samsung is offering with its 2016 TV family. At the top end, the entire SUHD range has been kitted with 10-bit, 1,000 nit displays. Essentially, this means every new Samsung SUHD is capable of playing back high dynamic range (HDR) content to the standard prescribed by the UHD Alliance (a body made up of a plethora of TV manufacturers, movie studios, and tech companies, including Samsung, LG, Panasonic, Disney, Fox, Netflix, Amazon, and Dolby). All 2016 SUHD TVs meet the UHD Alliance Premium certification. The certification is designed to help customers identify top tier products that have been engineered for optimal playback of 4K HDR content. 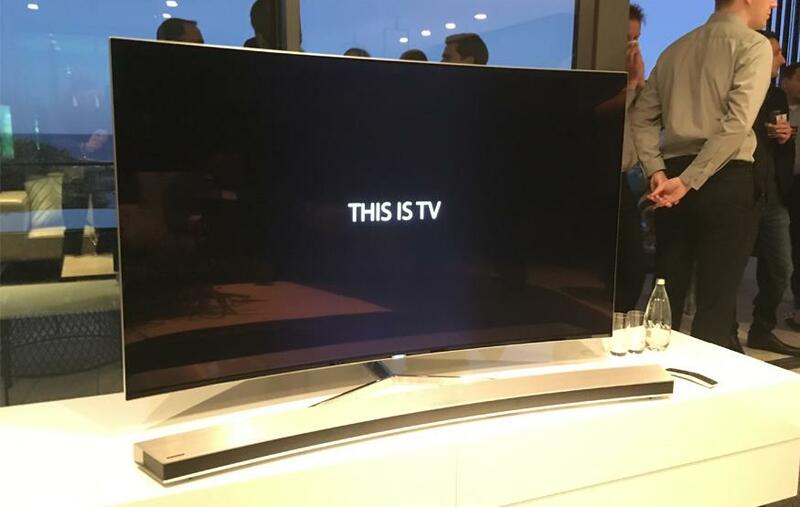 The TVs support the HDR10 standard, but not Dolby Vision. These specifications mean Samsung's 2016 SUHD TVs can display a wider range of colours, offer more contrast, and go almost three times brighter than a typical 4K panel (although Samsung's flagship TV for 2015 already had a 1,000 nit display). While this allows Samsung's 2016 SUHD TVs to playback HDR content (via Netflix or 4K UHD Blu-Ray), de Jong says the extra brightness also offers practical benefits. "What we are offering in our SUHD TVs really matches the Australian household and their viewing habits," said de Jong. "In Australia, 70% of homes having an element of open plan living. We know Australia is one of the brightest countries in the world – we're really lucky like that. What people need is a TV that can handle that." The 2016 version of Samsung's Tizen also features a new user interface that treats external HDMI inputs more like apps, in order to make swapping between apps and connected devices a more seamless experience. The interface will also highlight content from partners such as Netflix, allowing users to jump straight into a TV show or movie without the need to launch the app. Notably, Samsung's new remote control will also be able to interact with third party devices. For example, if a user were to turn on a game console such as an Xbox One, it would automatically be recognised as one. It would then ask the user if they wanted to change input, and then lets the user control the Xbox One without the need to reach for the controller. The KS9800 is the one SUHD TV to feature full array backlighting. The KS9500 and KS9000 series rely on "supreme" localised dimming, while the KS8500 and KS8000's local dimming doesn't attract the "supreme" moniker. Samsung will also bring a number of lower-end, non-HDR 4K and 1080p to Australia across the coming months.